Witty/romantic comedy. Headstrong/out-spoken Sabine (Béatrice Romand), working on her thesis in Art History, has tired of affairs with married men, such as Simon (Féodor Atkine). Playing Cupid, her confidante Clarisse (Arielle Dombasle) introduces her lawyer cousin Edmond (André Dusollier) to Sabine. Encouraged by Clarisse, Sabine impetuously decides that she will marry Edmond and tells her mother (Thamila Megrah) and sister Lise (Sophie Renoir). When confronted by Sabine, Edmond resorts to an astonishing/glib double-talk to explain why he is not ready for matrimony. 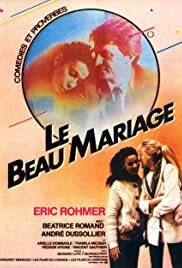 Béatrice Romand was the delightful/ talkative teen ager in 71 Claire's Knee, and commitment-shy widow in '98 Autumn Tale; Dusollier, in the whimsical '75 And Now My Love. Arielle Dombasle has appeared in many films, starting as a seductive beauty. Féodor Atkine played a somewhat slimy character in '83 Pauline on the Beach.